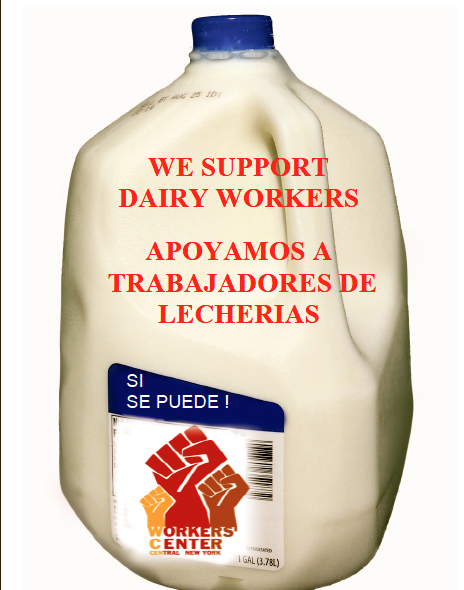 Fortified Milk with Worker Power! On July 23, 2013 at the offices of the OSHA Syracuse Regional District a meeting took place. This could have been just another meeting of workers’ advocates and OSHA representatives talking about the issues affecting dairy farmworkers in the region: the fatalities, the most recent one in February of this year [in Ithaca], or the countless stories of injuries coming from the workers we were meeting at our OSHA trainings. But this time three dairy farmworkers came to the table with us to speak about their own experiences as injured workers and that of many others. They showed their scars and they spoke with the conviction and credibility of someone whose lives are on the line every day they work with livestock, dangerous machinery and hazardous chemicals. Kevin, a 23-year old worker from Veracruz, Mexico, recounted his experience working at one of the biggest dairy farms in the North Country. He got injured three times, in a span of two weeks. One of his injuries, caused by a chemical that splashed on his eyes, left him blind for half an hour. He was working alone at 3 am without any personal protective equipment. He was so desperate for relief that he used water from the cows’ drinking well to apply to his eyes. There was no emergency procedure, no first aid kit, no one to help him. When he could see better he had to take the 45-minute walk alone, still in pain, to his trailer. Prior to the meeting we had educated ourselves about OSHA’s “Local Emphasis Programs”, which are enforcement strategies intended to address hazards or industries that pose a particular risk to workers. We learned about the 2011 LEP in Wisconsin, that focused on dairy farms the first and only in the country to focus on dairies. The LEP in Wisconsin involved OSHA inspections of randomly selected dairy farms without a complaint or a fatality, which are normally the only two reasons why inspections of workplaces take place. The three workers spoke about the lack of training and first aid when a worker gets hurt. And then asked OSHA to implement an LEP in the dairy industry in NYS, in the wake of three farmworker deaths in two years, and countless injuries. OSHA agreed to launch one in 2014. In the months after the July 23 meeting, OSHA has done intensive outreach to dairy farm owners and the organizations that represent their interests to inform them about how to be in compliance with OSHA standards in preparation for early next year when the inspections will start. As advocates and organizers we continue to talk to workers about their rights under OSHA and organize with worker leaders to speak up and get many more workers involved in making their workplaces safe. Last month we had a meeting with OSHA staff in which two injured workers talked about the hazards and dangers of dairy farms and the issues they face when they try to change those conditions. There has been several OSHA complaints submitted since July and the Workers Center of CNY has launched an organizing campaign with dairy farmworkers hand in hand with the advocacy and legal services expertise of the Workers Justice Center of NY. We have founded a dairy farmworker advocacy committee comprised of worker justice organizations, farmworkers and researchers who have begun to speak out about conditions on dairies. As we move forward we recognize this as a shared victory with our sister organizations The Tompkins County Workers Center, the Midstate COSH Foundation and the Occupational Health Clinical Center. All of our efforts have been strengthened during the meetings of the Upstate New York Worker Centers’ Alliance and more importantly, the voices and efforts and the risks taken by the workers remind us that we need to always believe in the power of the workers and follow their lead. Like Jose Cañas, one of the dairy farmworker leaders in this effort for workplace fairness and justice like to say “Necesitamos sumar sumar para hacer crecer el movimiento” “We need to add and add to make this movement grow”.